From homes to businesses, there are often times when a little quiet is necessary within a room or rooms. Soundproofing materials are fantastic at helping to absorb sound and reduce noise, but what happens when you only need soundproofing sometimes or when your needs change according to location? When your needs in soundproofing vary, soundproof folding room dividers may offer the solution you’re looking for. There are many scenarios in homes and office buildings where soundproofing is required. From creating a study area to partitioning off places where private conversations are had, reducing and absorbing sound can be hugely beneficial to many people. EchoPanel modular screen systems from Kerei offer flexible, versatile, and effective soundproofing solutions. Each panel, made from recycled plastic bottles, is designed to absorb the sounds in the area. The panels are pieced together with joints that allow you to customize the shape, size, and position of the panels to best meet your needs. 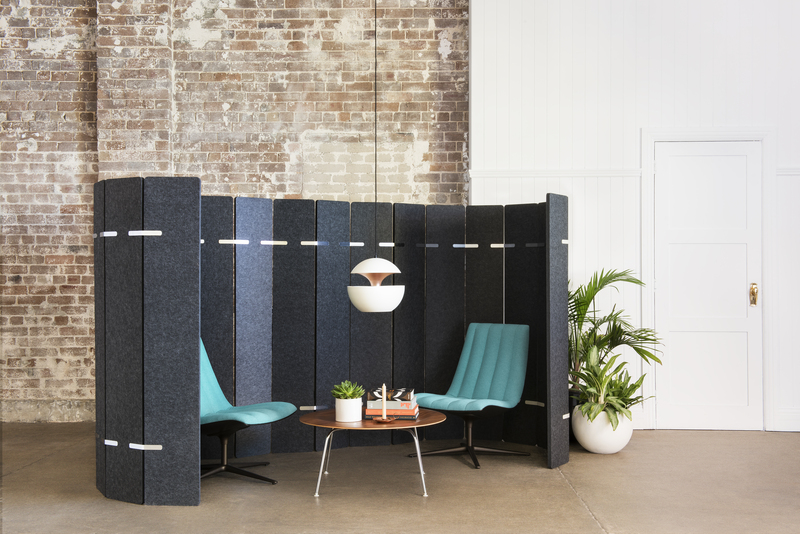 So, whether you need to quickly partition off a seating area to have a private conversation with a client, you want to set up a quiet study area in the midst of a busy room, the dividers can give you the results you need in just minutes. Soundproofing materials are available in a wide range of different styles and options. From tiles to panels that you can use to build furniture, you have more options today in soundproofing your home, office, or school than ever before. Soundproof folding room dividers offer a flexibility that adds another layer of usefulness, however. With a folding room divider, you have the ability to move the screen where you need it at the time. For open spaces and offices that have a more flexible layout, this is invaluable as it allows people to work and converse when and where they want to. Rather than adding soundproofing material to every inch of the room, the dividers let you move and set up the area you intend for use. They have the ability to screen you from view, as well as to help reduce the sound. So, you can get a more private area that’s useful for confidential conversations as well as for studying and concentration. Room dividers also allow you to create semi-permanent work areas that can be changed at any time with little issue. For example, putting a divider between two desks gives you two private spaces that can be turned back into one by simply folding the divider away. As more offices begin to turn toward an open layout with emphasis being put on communal spaces and more socialization within the workplace, having the ability to create a temporary private area is sometimes necessary. 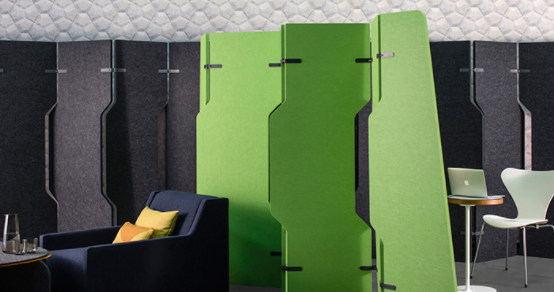 Room dividers that are also soundproof let you create the ultimate in privacy. And because they can fold flat when not in use, they’re easily stored until they next time they’re needed. Soundproof room dividers come in a several shapes, sizes, and colors, which enable you to customize their use to your needs. Whether you intend to leave them out on a semi-permanent basis and need something that will complement your office décor, or you plan on moving and setting them up on a case by case basis, you can easily find a set of panels that work with your needs. By selecting a “kit” of different parts, you can reconfigure your dividers again and again. Set up a three-way seating area to allow multiple users to have their own private space in one small area, or enclose a larger space within an open room to allow for quiet conversation. Depending on how you intend to use the panels, you can purchase a set, leave them joined and merely take them out or fold them flat as needed, or configure a new set up each time you use them by manually joining the panels together. Either option is possible with the same soundproofing materials, so you can trust that the area you are enclosing or dividing will remain private and quiet for as long as you need it to be. As a greater emphasis is placed on flexibility within home and building layouts, a greater emphasis also needs to be placed on the materials necessary to make these areas work to the best of their ability. Soundproof folding room dividers give you that flexibility, while ensuring that you have the soundproofing and privacy necessary for study, conversation, or sensitive work. 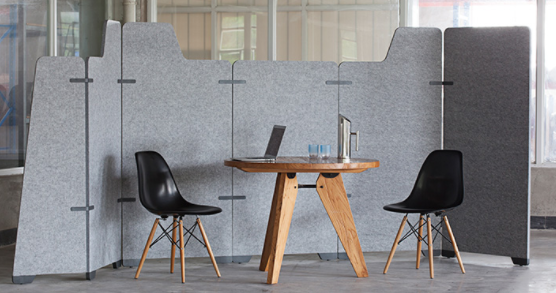 Whether you use them as a semi-permanent divider between two spaces, you continuously break them down and set them up in new ways, soundproof panels are a great investment in flexibility and function. Get the best of both worlds for your home or office space with soundproof folding room dividers to see what’s possible within a more quiet environment.